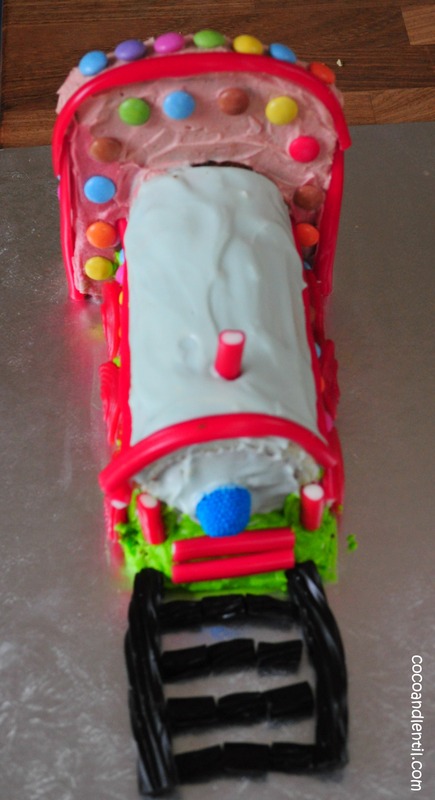 So I borrowed one of Lentil’s trains on which to model my cake. It was supposed to look similar. And this is what it actually looked like……! What went wrong, I hear you ask? 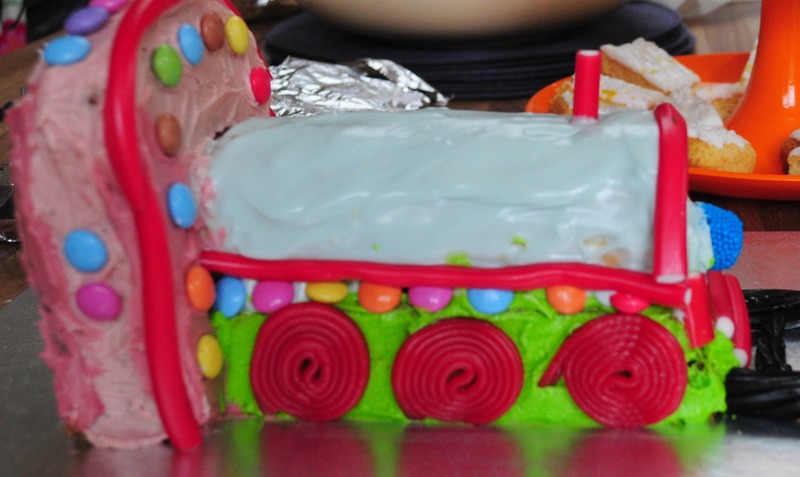 The plan was to bake the cake on Thursday evening, leaving Friday evening free for the icing and decoration. Thursday afternoon: migraine, spend the evening in bed instead of in the kitchen! Friday morning: hair appointment, which I’m soooo not cancelling as I haven’t been since before Trouble was born. Friday afternoon: Trouble decides she would like to alternate between feeding and being held for entire afternoon. What next? 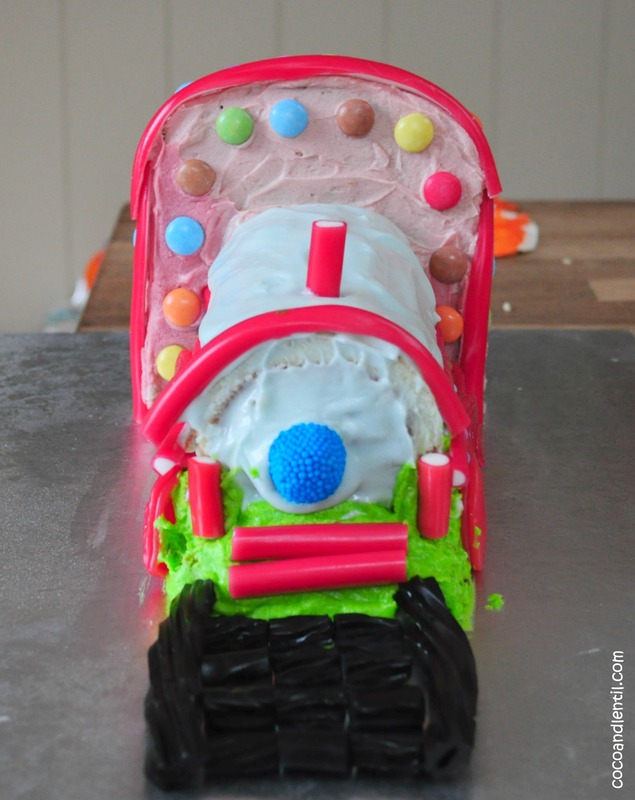 Fast forward to 10.15pm: Trouble is finally settled and I start making the cake….at last. I misread the recipe (of course!) and think I need to make double for two 8 inch cake tins. I then run out of vegetable oil for my double quantity, so substitute with olive oil – not ideal for my lovely light sponge, oh well! By the time the cakes are baked, I’m exhausted so decide I’ll do the icing in the morning – wishful thinking. Party kick-off minus 2 hours: I start to assemble the cake. The piece at the back falls over so I grab some wooden skewers to try to attach it to the rest of the cake and hope I remember to remove them later so no one ends up with splinters in their mouth! The next cake-tastrophe is discovering Grandma (who is over for the celebrations) has used all the icing sugar. Panic; some not so silent expletives; and then off to the shops to buy some more. 1 hour, 20 minutes to go: I start the icing, but it looks a little runny, fondant-like. I start spreading some with blue colouring, but it drips down the sides. The colouring has made it even more watery and it’s clearly not going to stick. This is not what I had in mind! I reluctantly make another batch of icing for the rest of the cake. The second batch is better, but the red is pink and the green slightly radioactive looking! However, all is not lost. 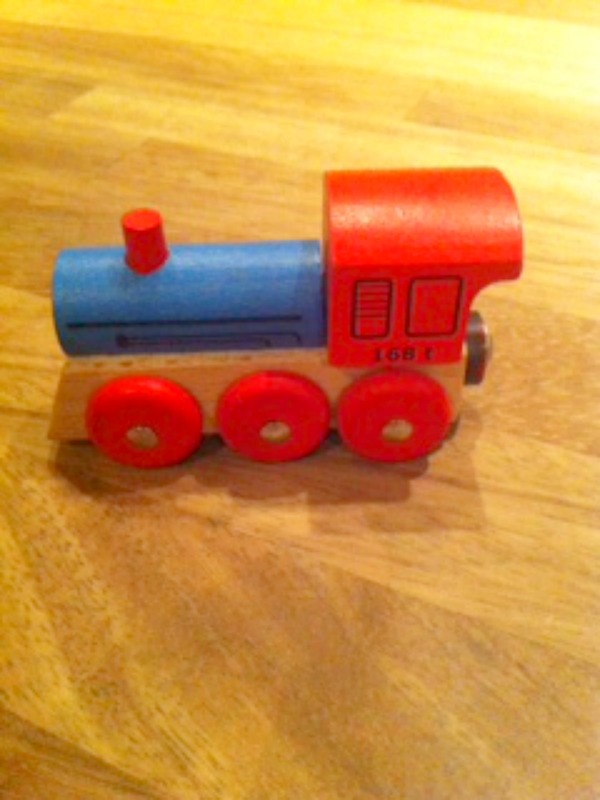 When Lentil sees it, he says “choo choo” so at least the birthday boy recognises it as a train even if no one else does! Better luck next year.